It's been a while but I'm back. There are a couple of things I hope to post over the Winter so there should be a slight burst of activity. The first condition was met a few weeks ago, and on Saturday, the Radio Times will be purchased. So with the Christmas mood starting to kick in, I thought it was time to watch a Christmas movie. The first one of the season was Rare Exports: A Christmas Tale. Set in Lapland, it is based on folklore and fairytale of the area and not the Coca-Cola image of Santa Claus that we are all used to. Missing kids, mauled reindeer and satanic elves are the order of the day for this Festive flick with a difference. With that watched, and the inevitable Best Of... list appearing in the Radio Times, in true Film 2011 style, I thought I'd post my Top 5 Christmas Movies. I know what my favourite movie is but beyond that, I haven't really considered putting any others in any structure of rank. So I thought to myself, over the summer, I'm going to try and come up with a definitive list of my favourite movies. So, it begins. Here are my 5 favourite movies not in the English Language. The plan for the fortnight was to chill out for the first half, and do a good bit of walking this week, however, that plan now looked to be a bit hindered. After the wash out of week 1, week 2 wasn't to fair much better according to the forecasts. This was a bit of a let down as I was going to go a walk with my brother and let him bag his first munro. SO just as it looked as though the majority of the week was off-limits, imagine our surprise when the MWIS forecast was very favourable for Tuesday. 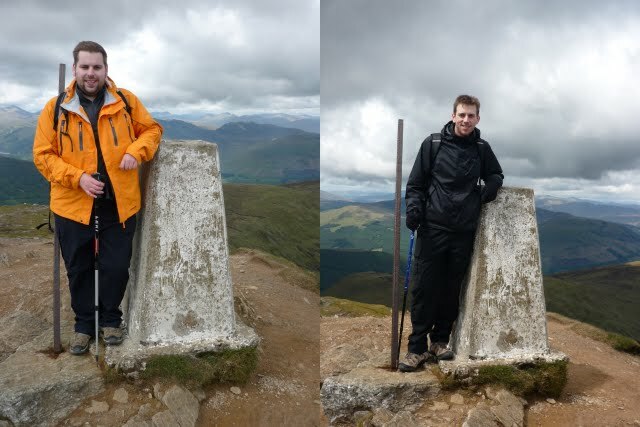 A couple of texts later, and a trip to Loch Earn to conquer Ben Vorlich was organised. One scenic drive later and we were parked up at Arvorlich House ready to start the ascent. As walking routes go this one is pretty good. A path has been set out from the beginning to the summit, so from every part you can see the scar up ahead and if you look hard enough the trig point on the summit you are aiming for. It started off quite easy. A good steady incline to get the initial knackeredness out of the way and let the lungs get a good build-up. After navigating the third stile you are away from estate land and onto mountainside with the only way being up. Looking back, you get the same picture every time so it was difficulty to judge how far up you were. To our surprise, the first time we checked, we were over a third of the way in. I was convinced we were not even at the height of the Lyle Hill yet so that was quite motivating, but it was about this point that bad things happened. I started to get a really bad pain in my right knee. If you know me, you will know that this is a problem area for me but usually it is just a niggle that I can get through. This was different. This was a proper stabbing pain with every footstep. I decided to march on and see how it would go. Somehow, we made it to the summit approach, with a good bit of scree separating us from the goal. Lord knows how I made it to this point and any thought of chucking it previously seemed a distant memory when I seen what I was to tackle next. This was going to take a while. Marching on through the pain was the order of the day and this final section was no different. The image above is basically what drove me on. The thought of the sights on such a clear day was an appealing prospect. A few determined stints later and we made it. Before the obligatory summit shots, we headed over to the cairn to ensure we had a shot at both points. From the cairn, we got great shots of what should have been summit no. 2 of the day - Stuc a' Chroin. With the amount of pain I was feeling, there was no way I was trying it. I'll leave that one for another day. Back to the true summit and it was time for pictures. Munro no. 11 for me and a first for Gaz. Getting to the top is half the battle. The descent is always another matter. The constant downhill impact gives my knee a battering at the best of times so I was not looking forward to this at all. Once passed the rocky final section, it was not too bad. The path meandered down with Loch Earn always being visible. Well, that was until we got to the stiles in the estate. When you have limited leg movement, crossing a stile is quite the obstacle. My week of walking was finished before it even began. The original plan was to try and get 4-5 munros done over the week but you know what they say about the best laid plans. I would have to settle for one this week and plan alternative ascents in the future. Although my plans have been hindered, it was good to finally get out and tackle a hill with my brother. Hopefully, there will be some more in the future. In regards to the knee, there doesn't seem to have been too much damage. Two days later and the sharp sensation is away and I can actually walk without looking like I am completely immobile. Breathtaking scenery. Tropical weather. Different cultures. Copious amounts of food and drink. Everything you could ask for from a break away. But when you stay in Scotland, the tropical weather is more reminiscent of a tropical rainstorm opposed to blistering blue skies. And this was no different. Welcome to Fort William at the end of May. I did joke with Dad earlier on that if the weather is bad, this is pretty much going to be three days sitting in the pub. The 5-day forecasts weren't helping but we were still holding out a bit of hope [because we all know, forecasts are slightly unreliable]. Imagine the despair, when it was the rain battering off my window that woke me up on Monday morning. This was going to be a long three days. The plan was to get to Glasgow early, take time over breakfast then be in Queen Street in time for the northbound train. What happened next was basically the prerequisite for the rest of the holiday - the Gourock to Glasgow trains were off. In true Scotrail fashion, they resumed quicker than expected with no explanation and we eventually found ourselves in Glasgow with some time for fuel at the Counting House. Even more surprisingly, the 09:07 Fort William train was on time and it was time for Dad to experience the sights of the West Highland Line. Once we had passed the build up areas of Dumbarton and Helensburgh, the day was looking up. There were some blue patches around about the Arrochar - Crianlarich areas but this was short lived. The clouds came right down and the downpour pretty much stayed constant until Tuesday with it getting worse the further north we travelled. We arrived in fort William just after lunch and to escape the weather we darted into the first pub we could. Through the door, we were confronted with clouds of smoke. It turns out, the open coal fire was on full burn to counteract the weather; and it was good. The rest of the day continued to be pretty much of a wash out and a lot of time was spent in the hotel and it's bar. We were seven days off June, and this video from About Lochaber pretty much sums it up. It was proper blowing a gale, and to compound matters even worse, Fort William was hit with a town wide power cut just as we finished our tea. Tuesday was to be one of the main events of the few days away. The tickets were booked and collected to travel on the Scotrail service to Mallaig and finish off the full West Highland Line route. This was scrapped beyond our control before I even got out of my bed. The radio was reporting major train disruption across the whole network, specifically naming the Mallaig service as one that was indefinitely cancelled. This break was getting better by the minute. Not to be too despondent, we wandered though the high street and noticed the Jacobite steam train was sitting in the station. We might be able to salvage some kind of photograph from the holiday. A few snaps from Dad later and it was time for lunch. We decided to head back to the hotel and sample their snack menu to leave room for a big tea. Numerous hotel bar hours later, and we began to get more hope. The dry spells were becoming more frequent so we decided to jump into full tourist mode. Banavie was the destination in the hope to see the the Neptune's Staircase section of the Caledonian Canal. It was quite an impressive sight but due to the weather there were no boats about and none of the locks were in operation. To compound things, just as we got to the top of the locks, we got a day's rain in 5 minutes only to brighten up again after we were suitably drenched. The word scunnered came to mind but this was short lived as Banavie provided us with a nice surprise. Ben Nevis is the biggest mountain in the UK. Being so, you would think that you would get some kind of view of it from the town that sits at it's base. This is not the case. The summit of Cow Hill, obscures any view of Nevis range from Fort William town centre. But not from Banavie. From here, you are afforded unparalleled views of the range. The weather wasn't ideal but it allowed Dad to see how quickly the weather can change up a height. One minute there was not bad visibility and the next, you couldn't even tell there was anything there. The original plan for Wednesday was to get brekkie, check out of the hotel and head round to Nevis Range and take the Gondola up to the 650m top station to let Dad get a sample of what it's like to be up a height. That plan got scrapped on Tuesday. After the train cancellations and the changeable weather, we decided to head down the road on the earlier train. So that was that and we were in Fort William station waiting on the 11:40 Glasgow Queen Street service. however, all was not lost. The return journey down the road had slightly more visibility than Monday's journey up. As well as getting good scenery, this was quite beneficial as seeing the areas on the line helps plan a few of the future hill walks I intend to do on public transport. Following on from the success of The Little Mermaid, Disney would enter the nineties on a high. First up was the The Rescuers Down Under. This was breakthrough for a number of reasons. Firstly, it was the only time until now, a sequel would be added into the Classics canon. Secondly, and more importantly, it is the first entry to be fully constructed in a digital environment. I didn't like 1977's The Rescuers, but this is a completely different film. The setting of the Australian outback really does bring a breathe of fresh air to the predominantly darker settings of the previous few decades. I really did like the fact they modelled McLeach on George C Scott as well as using his voice. I have to admit, I have been struggling with this challenge. As much as I love my animated movies, I think I have been spoiled with the Pixar CGI-fests which is making some of these quite laborious. However, this one has reignited my drive to get this done. The end of the eighties signified a turning point in the history of Disney. Previously, each film would have a few years between each other with there being no more than 4 in a decade but this was to change. Just a year after Oliver and Company, The Little Mermaid would be released. This was to start a run which would maintain an average of one per year until present day. But more importantly, this was to be the start of the Disney Renaissance, widely regarded as the period which made them financially viable to be who they are now. I'll be honest, I didn't like it and I don't know why. It had all the elements you could ask for - visuals, music, characters and storyline but it just didn't grip. Passed the halfway mark and it was the turn of Victorian England. The Great Mouse Detective follows Basil, a Sherlock Holmes-esque mouse who happens to live in the skirting boards of Holmes' Baker Street residence. Closely resembling what you would expect from a Holmes' inspired story, Basil provides some standard Disney fair - good visuals, simple story and likeable characters. Thanks to the predictable British TV schedule at Christmas and the Blu Ray restoration of Bridge On The River Kwai, I kind of had the urge to watch a lot of David Lean movies in recent times. This meant I finally caught the definitive Oliver movie. With this still sitting in my memory, I was quite intrigued to see that Disney had indeed put their spin on the Dickens' classic with Oliver And Company. The first thing to notice about this movie is the setting. Unlike most of the movies where you could struggle to place a period in history, it is clearly set in contemporary New York City. This is another one that can go on the enjoyed pile. Based on The Chronicles of Prydain book series, The Black Cauldron marked the halfway point in the Walt Disney Classics canon. This movie marked a departure from the traditional disney fairytale. In this one, the usual array of fluffy animals and pets were replaced with a more sinister style of character. Ogres and goblins were the order of the day with the highlight sidekick, Gurgi, being completely non-descript. If you want an example of the Disney quality being used for a magic/fantasy storyline, I would highly recommend this. The Fox And The Hound was the first release of the next decade. This was absolutely brilliant. I reckon this is definitely in the top 3 films on the list so far. The film deals with the unlikely childhood friendship of Tod, a fox, and Copper, a hunting hound. Copper soon leaves for the winter to learn how to hunt. By the time Spring comes, both characters have developed into older versions of themselves with Copper's changing attitude causing a strain on the previously unbreakable bond. I think this was, by far, the best example of an animated family movie which can be used to highlight a social issue to kids. It's been a while since I blogged about the progress of Project Disney. I've ended up doing what I was hoping wouldn't occur. I've watched a good few movies but not kept up with the blogging. I've decided to put the next batch up as single post covering the four movies of the 1970s. First up was The Aristocats, the 1970 effort about a family of family of aristocratic cats who have a good life in the mansion with their rich owner. This is all turned upside down when the butler decides to kidnap them in an effort to benefit from their owner's fortune. In a similar vein to Lady and the Tramp, the well to do lead characters befriend a streetwise alley cat who helps to save the day. Actually when you think about it, it pretty much is the feline version Lady and the Tramp. It is this reason why I didn't really like it. It felt too samey. Next up was Walt Disney's take on the classic tale of Robin Hood in 1973. I was looking forward to this as I remember it being one of my favourites as a kid. I have to admit, I found it quite poor watching it again. Just like The Aristocats, it was like watching a repeat of other Disney cartoons due to the duplications of characters and scenes as a result of the small production budget. 1977 was a double release year. In March The Many Adventures Of Winnie The Pooh was released. I think of all the releases on the list, this is the one I was most curious about. Winnie the Pooh is known in almost every household. It is probably the biggest franchise in terms of Disney merchandising. But, I have never seen, read or being involved in a story of Winnie the Pooh. I know of the different characters but not how they are related. The film is a selection of three previously released stories that have been linked together through an off screen narrator while following the books on the screen. I think the shorter stories works when you know there is continuity with the characters and because of this reason, the film was highly enjoyable. It was a good insight into the franchise and was highly enjoyable with only one flaw. Tigger must be the most annoying character to have ever been penned by a Disney animator. Released in the summer of '77, The Rescuers completed the Walt Disney Classics slate for the decade. And I must say, they didn't go out on a bang. For me this summed up the decade. With the exception of Winnie The Pooh, I felt this decade was a lesson on how to live on past glories by rehashing old ideas. Easter weekend was approaching and the weather was set to be nice. There was no way we were not going to attempt a walk. After some deliberations, it was decided we would try Beinn Tulaichen and Cruach Ardrain. Both these hills are situated in the Crianlarich Hills. The route we were going to take was to start at Inverlochlarig Farm to the South. This would take in Beinn Tulaichen first then following the ridge along to Cruach Ardrain then descending from the bealach between the two. We made it along the one track road to the car park and finally set off. Walking along the path to the farm, we saw the first of what was ahead of us. It started off simple enough. There was a track to follow and the farm encourages walkers by placing signs and setting designated routes up. That was until we got to the bottom of Beinn Tulaichen. There comes the point you just have to turn left off the path and head up to get to the ridge. That point is not signposted, so you just have to make your own judgement when you want to head up. And up we went. There was no beaten track to follow, so every footstep was on fresh hillside which didn't help on what was a pretty unrelentless slog. This was tough going and there were a few more leg stretch stops than there should have been. Further up, a path had started and the going got easier. Following the path at a steady rate, we finally found ourselves on the first ridge and Munro No. 9 was achieved. This was the toughest one yet. If the first section had similar underfoot conditions to this bit, I reckon I wouldn't have struggled as much as I did. But as it was, we partook in some lunch at 946m. Although the prolonged rest was good, I felt a bit crap as I single-handedly added about 40 minutes of unnecessary rest time on from the first bit up the open hillside. From the summit there was a clearly defined path NW along the ridge to Cruach Ardrain. I have to admit, if munro no. 9 was difficult, munro no. 10 was easy. It was so pleasant I pretty much led the way for the whole bit which was a first for the day. The final push was in sight, and there was a strong breeze which was a relief considering how sunny it was. Double figures have been achieved with Munro no. 10 ticked off. I honestly couldn't see both these summits far enough when we were about 300m [ascent] into the walk. The second one was reached in just shy of an hour which is not far off the time we would have expected so my second wind arrived just in time. Now it was time to get down and back to the car. As stated earlier, we plnned to go the way we came and head down east from the bealach eventually meeting the landrover track back to the farm. After looking at the maps and evaluating the path that was there, we decided to descend on an alternative route. This route was a bit tougher than expected. There was a lot more sections we navigated that we hadn't encountered before. A couple of slides, slips and mud stained patches later we were passed the rocks and heading steadily down previously untrodden grassy slopes. After what seemed like an eternity [2hrs 30m], we finally caught site of the track which had the carpark at the end of it. What we didn't expect was that the car was still a good 4km away. Even with keeping what we thought was a good pace, it still took us 45 minutes to get there. Get there we did though and getting those boots off on a roasting hot day was a bit of light relief. This was a strange day on the hills. Probably my worst if I'm honest. After achieving munro no.8 a couple of weeks ago, I think I went into this one with a bit of naivity about my fitness level. I'm not even going to say it was a reality shock, because in reality I know I am carrying too much weight [as highlighted by my spare tyre in the summit pics]. I think it highlighted how easy the last one really was and my reliance on a beaten track. If I was on my own, I don't think I'd feel as bad. It would only be my time I'm wasting but when you are with other people who can achieve it easily, it does play on your mind. I've got a couple of weeks off in a few weeks and I was going try and do a solo effort or two so this has definitely spurred me on to get my levels up. Here's hoping next time, it's a bit more successful.